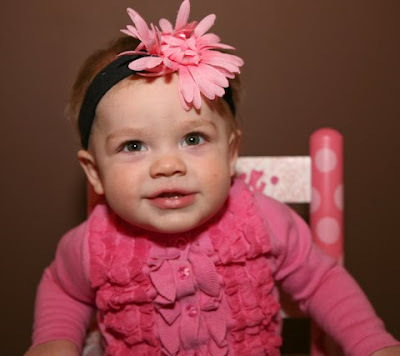 This was Harper one year ago today - January 28, 2009. We were in the middle of an awful ice storm both in Tulsa and at home. I will never forget it. Scott, Mom and I stayed together in one room at the Ronald McDonald House which luckily was right next to the hospital so we could slide down the road and be with her all day. 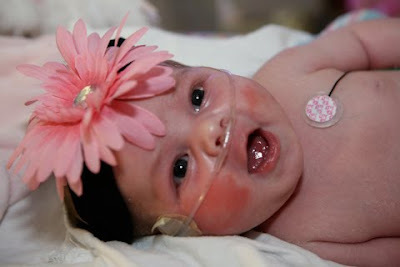 One year ago today when she was 12 days old - they took her off the ventilator and let us hold her for the first time. One year ago today was the best day of my life. 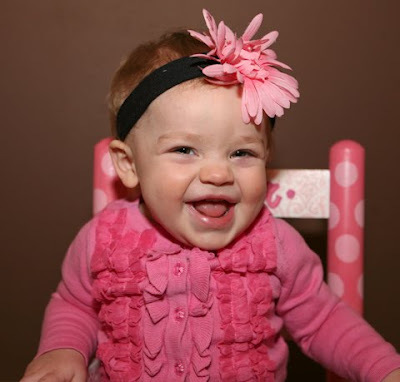 and here is Harper one year later wearing the same flower headband and the same sweet smile. Every day since then has been my "next" best day of my life! and we are preparing for another big ice storm this year! I'm so worried about losing power. We could live if it was just Scott and I but having Harper adds a whole new dimension. 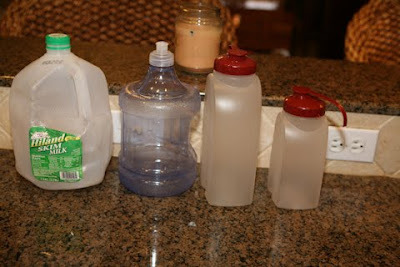 I'm pulling out containers to put water in "just in case". Hopefully we won't lose power. We have plenty of food, diapers and other necessities. And as I worry about losing power and how we will live - my very next thought is the people of Haiti. They have been living without food, water, shelter or really ANYTHING for over two weeks now with no end in sight. They have lost love ones and everything they owned. Puts my little ice storm in perspective and causes me to pray even harder.